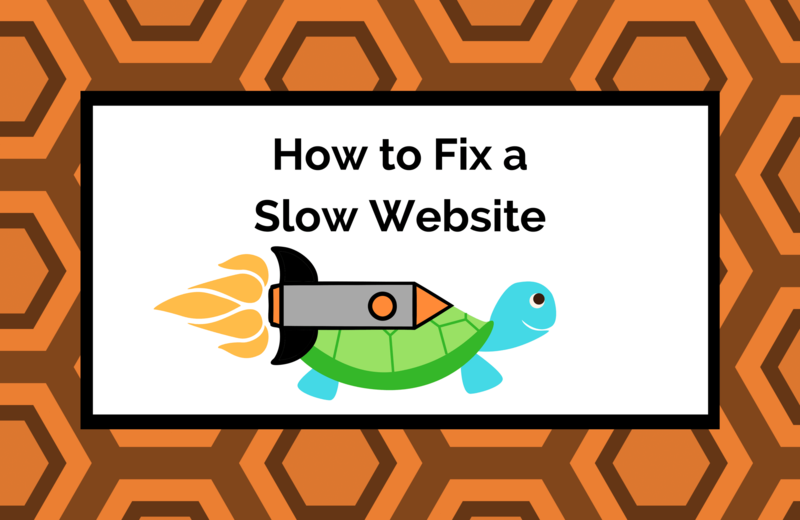 If your website is running slowly, one of the reasons below might explain why. Luckily for you, we’ve also included how to fix these issues. It’s time to get your site back to tip top shape. It might not be your website at all, it could be your entire local network. Try loading other websites. If they are running slowly as well, then you know you can blame the network. If other websites are running smoothly, then sorry, it is probably your website. Keep reading for more reasons why your site is running slowly. Your website could be loading slowing because of issues with the server. If your server is acting up, this indicates a problem with your hosting. Are you using a free hosting service? These are not as reliable as paid services, such as GoDaddy, DreamHost, InMotion, or HostGator. If you aren’t on one of the above hosting services, it’s possible you are paying for a low-quality service and you need to switch. Another reason your site could be slow is that your hosting package isn’t good enough to support your site. Contact your host and ask about available upgrades. If your network and hosting are fine, it’s time to run a speed test. To run a speed test, we recommend using GTmetrix. Some of the most common factors contributing to a slow website are image size, problems with plugins, bulky code, unnecessary redirections, or an outdated content management system. If images are slowing down your website, you’ll want to replace them with smaller, lesser quality images. Our favorite image optimization tool is Optimizilla.com. Drag and drop your images, watch as the site compresses your images without losing quality, then download an re-upload to your site manually, or with a plugin like Enable Media Replace. If your website is serving images at a different size than the file you uploaded, this could also be slowing down your site. Remove that extra step in the loading process by adjusting the height and width of the image in the page’s HTML. Be careful to adjust the image proportionally, or else you will find yourself with a wonky, stretched photo. Is a Plugin Slowing Down Your Site? If you have lots of plugins running in the backend of your website, one of them may be slowing down your site. Google search each plugin for online reviews to make sure that each one is safe and without a recorded history of other users experiencing issues with their own websites. When you stumble upon a plugin that you probably should not have downloaded, check with your webmaster before completely removing from the backend to ensure this will not cause further issues. Bulky Code Got You Down? Inefficiently written code can also slow down your website. Take a closer look at your site’s code to check for unnecessary line breaks and excess spacing. If you’re unsure of how to do this, contact your webmaster or hire a professional coder/programmer for assistance. Can Redirections Slow Down My Website? There are two main types of redirections: 301 and 302. 301 redirects are permanent, meaning a page has moved addresses for good. 302 redirects are temporary, meaning a page might be gone right now, but may return at a later date. Redirections are normally fine to implement on a website, but if they are used too often or incorrectly, your site could be slowed significantly. One situation to avoid at all costs are redirect chains, or one page redirecting to another, that redirects to another, that redirects to another, until the chain finally reaches its end. Even worse, it’s possible to accidentally create redirect chain loops, where one page redirects to another, then that page tries to redirect back to the original, and they redirect back and forth without actually loading the page until an HTTP error code appears. Redirections are either coded into the site, or input using a plugin in the backend. Depending on the setup of your website, you can fix any redirection issues yourself or with the help of a programmer. Our favorite tool for checking redirections is Redirect Path by Ayima. If your CMS is out of date, it is likely slowing down your site. Most CMSs will notify you once an update is available, but if you haven’t received a notice or haven’t updated your CMS in a long while, this is something to look into. Running an outdated version of your CMS can also present security vulnerabilities to your site, so you want to always update as soon as possible. If you’re too busy running your business to worry about your site’s speed, the Frozen Fire team can help you out. Contact us today to learn more about our website management services.